For donkey’s years the public has been assured that “bad” metal detecting is the province of nighthawks. Lately though officialdom has come up with a definition which blows that simplistic notion out of the water. 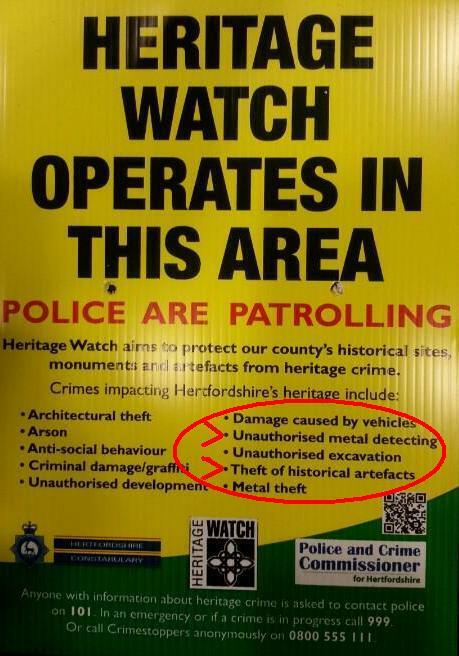 They say heritage crime is “harming the value of heritage assets and their settings”. On that basis a lot more than nighthawks are guilty. It works like this. Thousands of “legal” detectorists take finds home without showing the landowner (often with dodgy written agreements authorising them to). That in itself isn’t exactly indicative of a fair minded fine fellow that you’d want your daughter to marry but it’s what it can lead to that matters. If you have an agreement that valuable finds must be shared 50-50 the temptation to not tell the farmer about valuable finds is intense – and crucially it follows that you aren’t going to tell The Establishment either, lest the landowner finds out. Hence, without doubt, the value of heritage assets and their settings” will be harmed. So Officialdom has been hoisted by it’s own petard – or at least by its own definition. We’ll be glad to hear a contrary opinion but don’t anticipate one will be forthcoming. Call it the British Fib, it’s been going on for 17 years. A particularly obnoxious manifestation will take place later this year, courtesy of Central Searchers. 350 detectorists will be working under the rule that anything found worth up to £2,000 (as privately assessed by the detectorist alone) belongs entirely to the detectorist and anything worth more has to be shared with the landowner. Yes, the landowner is likely to lose out (since it is the detectorist alone who sees and values the item). But more importantly its not beyond possibility (to say the least!) that anything worth anything near £2,000 or indeed anything worth vastly more, may not be reported to the authorities for fear the farmer will find out. That’s a heritage crime and The Establishment says not a word about it. Here’s a police poster. Not a single solitary word about not reporting being a heritage crime. The police and The Establishment will tell you that the reason for that is you need to be committing a crime to commit a heritage crime and “non reporting” isn’t a crime. However, depriving a landowner of his share IS a crime, it’s theft, so not reporting a find to conceal the fact IS a heritage crime. The British Establishment and police are lying to themselves and to the British public. Now listen to the stony silence!